By turning Option into the Meta key, you will be able to use familiar meta commands to jump around and navigate text in places like Emacs or bash shell without twisting your fingers around to poke at Esc. This won’t be applicable or useful to everyone, but it’s one of those must-use tricks for frequent terminal users or for anyone coming to the Mac OS X platform from a background in unix. Changes take effect immediately for all terminal windows using that. You can test it out by using commands like Option+B to jump forward a word, and Option+F to move back by a word, Option+M to return to the beginning of a line, and so on. 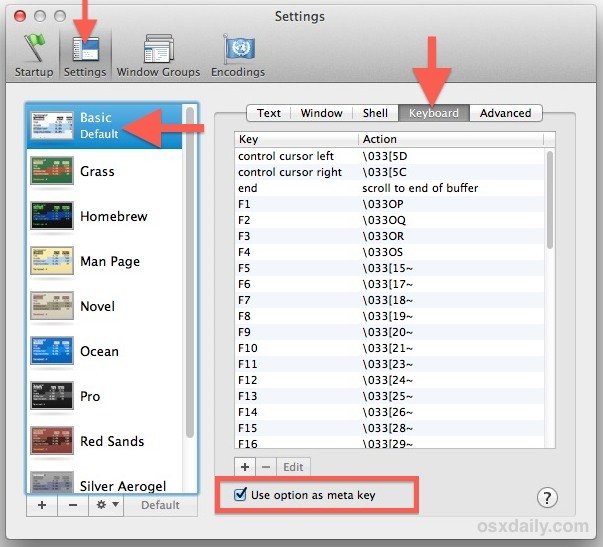 The meta shortcuts are different from the standard text navigation shortcuts that are tied to the Control key and that work pretty much everywhere in Terminal and often across GUI based apps in OS X too. If you didn’t know, the meta is enabled by default in OS X Terminal, but it’s assigned to the Escape key which isn’t particularly useful for those of us who are accustomed to the control, alt option, and command keys being used for keystroke shortcuts. iTerm users can also make this change in the Profiles section of Preferences. Thank you for me suggestion, but I found that it isn’t as convenient as it initially seemed, because (with Spanish keyboard on Snow Leopard) after checking “use option as meta key”, the alt key can no longer be used to produce any of the following charactrers: ~#¬]}|\ which of course are important in a terminal/emacs context! It would be fine if the only alt key affected by checking the box were the left alt key, while the right one retaining its ability to produce those characters. I was looking around because I have exactly the same problem. Did you find a solution in the meanwhile? In case you never found a solution to this, iTerm 2 supports having different behavior for the left and right option keys. I use left option for meta and leave right option alone for typing special characters. It’d be great if we could duplicate Control and Option keys to the same function in Terminal. This is years late, but for people coming across this page whilst searching for a solution, as I did, I have decided to build one myself. It is a simple status bar app that runs in the background and rewrites all left-Alt + $KEY key events to two key events in rapid succession, Esc, then $KEY; however, it only does this if Terminal.app is the focused application. You can find it here at https://github.com/habibalamin/Metalt.